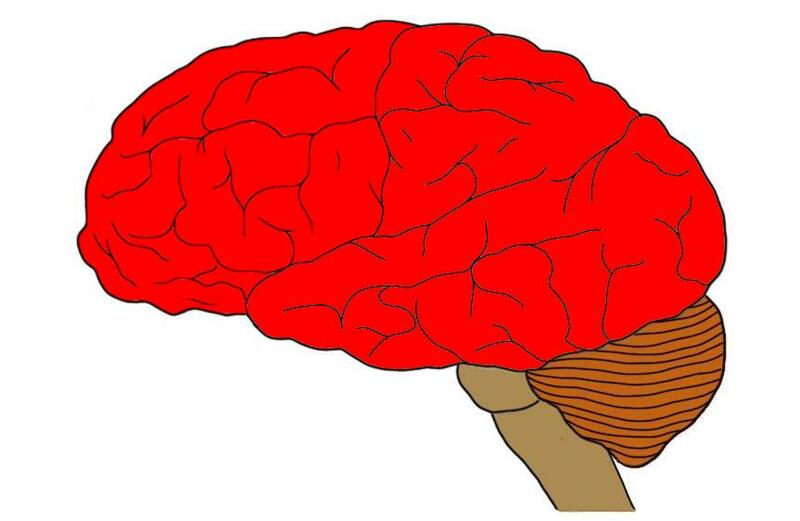 The telencephalon highlighted red. The telencephalon not only includes the cerebral cortex (visible here) but also a large number of subcortical structures, pathways, etc. The telencephalon is also known as the cerebrum, and it consists of the largest part of the brain (it makes up about 85% of the total weight of the brain). It contains the cerebral hemispheres, and thus includes the cerebral cortex and a number of other structures lying below it (subcortical structures), along with a variety of important fiber bundles like the corpus callosum. The inferior boundaries of the telencephalon are found at the diencephalon (e.g. thalamus and hypothalamus) and the brainstem. Posteriorly, it is bordered by the cerebellum. What is the telencephalon and what does it do? The telencephalon begins to emerge in embryonic development at about 5 weeks. At this time, the nervous system consists of tube-shaped piece of tissue called the neural tube. The neural tube begins to develop swellings (called vesicles) that will later develop into important structures in the nervous system. The swelling that forms at the farthest end of the neural tube is called the telencephalon (telencephalon is Greek for "far brain"). As development continues, the growth of the telencephalon far outpaces the growth of the other structures of the nervous system. The telencephalon begins to expand into two symmetrical structures that sit alongside one another at the very end of the neural tube; these will become the cerebral hemispheres. Initially, the surface of each cerebral hemisphere is smooth, but over the course of neural development it becomes more convoluted until it takes on the appearance of an adult brain with its many sulci and gyri. Thus, the cerebral cortex is part of the telencephalon---as are all of the divisions of the cerebral cortex like the prefrontal cortex, motor cortex, somatosensory cortex, occipital cortex, and so on. In addition to the cortex and its recognizable features, there are a large number of subcortical structures that are considered part of the telencephalon. These include the hippocampus, amygdala, and a majority of the regions included in the basal ganglia, among others. Also a multitude of major pathways traverse the telencephalon, such as the corpus callosum---a large bundle of fibers that connects the two cerebral hemispheres---and the internal capsule---another prominent collection of neurons that carries almost all information to and from the cerebral cortex. The telencephalon is too large an area of the brain to try to link it with a function or short list of functions. It plays a role in most of our brain activity and thus is more analagous to an entire division of the nervous system than to a particular delimited brain structure. Haines DE. Fundamental Neuroscience for Basic and Clinical Applications. 4th ed. Philadelphia, PA: Elsevier; 2013.